The challenge for policymakers is to move away from the unemployment threshold of 6.5 percent without raising expectations of an increase in the short-term interest rate. (Bloomberg) — As Janet Yellen seeks to forge a consensus on a new strategy for communicating the Federal Reserve’s intention to keep rates low, she can reach for a six-year-old tool: the Fed’s quarterly forecasts. Policy makers plan to abandon their promise to hold interest rates near zero at least as long as unemployment remains above 6.5 percent, according to minutes of their January meeting. With the jobless rate dropping to 6.6 percent and the economy still in need of support from the Fed, the strategy is nearly obsolete. Now, the challenge for the policy-making Federal Open Market Committee is to move away from the unemployment threshold of 6.5 percent without raising expectations of an increase in the short-term interest rate. One option policy makers discussed last month is to rely instead on their forecasts for inflation, unemployment, growth and the benchmark interest rate — known as the Summary of Economic Projections — as a way to signal their policy intentions. Fed Chair Yellen took a leading role in conceiving how the central bank should use the forecasts as a communications tool. As former Chairman Ben S. Bernanke’s top deputy, she ran a communications subcommittee that in 2012 overhauled the forecasts to include predictions for the path of the benchmark interest rate. The Fed’s so-called forward guidance evolved after the central bank cut the main lending rate almost to zero in December 2008. At that meeting, Fed staff told policy makers that “it would be helpful for the committee to provide more- explicit information about its views on the likely future path of the federal funds rate,” according to transcripts released last week. They did that initially by saying that the benchmark, the interest rate banks charge each other for overnight loans, would stay “exceptionally low” for “some time,” or for “an extended period.” That was later changed to guidance based on a specific date. Finally, in December 2012, the Fed linked the outlook for the benchmark rate to the level of unemployment and rate of inflation. Unemployment in January fell to a five-year low of 6.6 percent, compared with 7.9 percent when the threshold was adopted. The trouble is that FOMC officials still see plenty of slack in labor markets, and inflation has consistently run below their 2 percent target since May 2012. The committee has provided guidance not linked explicitly to its two policy goals of stable prices and full employment, and it will probably return to qualitative language once again, said Michael Gapen, New York-based senior U.S. economist at Barclays Plc. The FOMC participants’ own estimates for the policy rate could be a fallback. In their December projections, 12 of 17 Fed officials estimated that the first increase in the benchmark lending rate would occur in 2015. The median forecast for that year was 0.75 percent, implying at least two increases during that year. Using the forecasts as a guide to the rate outlook poses challenges. Because the Fed doesn’t disclose the names of the forecasters, the median rate may not reflect the views of the voting members of the committee who decide on policy. The voting membership is limited to 12 people: the seven members of the Washington-based Board of Governors along with five of 12 regional Fed bank presidents. 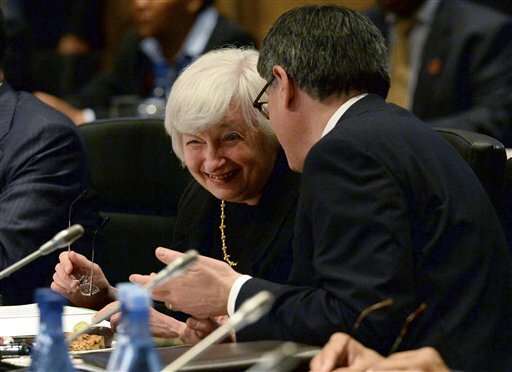 The New York Fed chief has a permanent vote, and the others rotate. The Fed could improve the SEP by identifying individuals by name, said Millan Mulraine, deputy head U.S. research and strategy at TD Securities LLC in New York, one of the 22 primary dealers authorized to trade directly with the Fed. The forecasts of the Fed chair, vice chairman and New York Fed president, for example, provide a more useful guide to the central bank’s policy intentions than those of a regional Fed president who may disagree with most members of the committee and only vote in one year out of three. A second challenge: the committee would never harness itself to what is essentially a poll of its members about the short-term rate, Mulraine said. The economy is too dynamic, and central bankers update their judgments every time they meet. The quarterly forecasts can quickly become stale. “They don’t want to pin themselves down, or have markets pin them down, on specific dates,” Mulraine said. When Yellen was asked to improve the forecasts as vice chair, she headed a subcommittee that included Philadelphia Fed President Charles Plosser, a consistent opponent of the Fed’s record monetary stimulus, and Chicago’s Charles Evans, one of its strongest advocates. She was able to unite the committee to agree on publishing interest-rate forecasts and adopting a statement of longer-term goals and policy strategy. The changes were announced in January of 2012. “That was no easy task in terms of consensus building,” said Antulio Bomfim, senior managing director at Macroeconomic Advisers LLC in Washington and a former Fed economist. It suggests Yellen may be able to forge agreement on how to replace the unemployment threshold. Yet efforts over the rest of 2012 to further expand the forecasts broke down. In August and September of 2012, the Fed tried to develop an experimental consensus forecast for the likely path of the economy and considered other enhancements. The Fed’s seven governors and 12 regional presidents had views about the economy that varied too widely to adopt a clear consensus. In January of 2013, Bernanke asked the subcommittee to “explore potential approaches to providing more information about participants’ individual views of appropriate balance sheet policy and its conditionality,” according to minutes of that meeting. Nothing has been announced since then. Officials are far from settled on their next approach, according to minutes of their January gathering released Feb. 19. The minutes show some members want to stick with numerical thresholds, while others want to ditch them. The Minneapolis Fed’s Narayana Kocherlakota has argued the central bank should pledge to keep its target rate low until unemployment hits 5.5 percent, a full percentage point below the current threshold. On the other side of the debate, James Bullard of St. Louis and San Francisco’s John Williams argued in speeches last week that the Fed should instead use “qualitative” guidance. A shift to qualitative language about progress on labor markets and inflation also has drawbacks, said Gapen, a former member of the Fed Board’s Division of Monetary Affairs, which formulates policy strategy for the FOMC. Some officials want a mention of too-low inflation as a key consideration for keeping rates low, while others want to include financial instability as a condition that could prompt a rate increase.